Meetings with partners and institutes to exchange ideas are always valuable opportunities as we strive to develop innovative protective products that offer value added to not just our customers, but the uvex group as well. On 22 September 2015, the certification centre for protective textiles of the Sächsisches Textilforschungsinstitut (STFI) organised an information event in collaboration with the Institute for International Product Safety (I²PS) on the subject of protection against electrical arcs. We gladly accepted the invite and this blog entry shares some impressions and insights gained from the day. More than 40 participants gathered for the event held at the I²PS in Bonn, Germany. There was in fact far greater demand for places, but unfortunately the number of visitors was limited. Textile and clothing manufacturers as well as clothing rental companies participated. Hendrik Beier, Department Manager of the certification centre, hosted a fascinating day for attendees. A presentation from the prestigious, accredited testing institute I²PS offered an introduction to the testing laboratories located in Bonn. The event continued with an illustrative speech given by Hendrik Beier, , presenting the dangers of electrical arc accidents and imminent changes to the standards regulating electrical arc protection. At the end of the day the audience had the chance to view four electrical arcs created in the laboratory. The majority of participants witnessed, such huge explosions for the first time with their own eyes (see Figure 1). What are electrical arcs and how do they arise? To protect from the thermal hazards of an electrical arc, uvex safety textiles offers a comprehensive range of protective clothing (uvex textreme fire + arc) encompassing all different protective classes. In addition to reliable textile protection, Hendrik Beier also stresses the importance of creating a closed seal between protective clothing and head protection. The STFI has been carrying out arc testing on material and protective clothing in the testing laboratories of I²PS every month since 2005. When testing protective clothing, a jacket is placed on a dummy and targeted with artificially created electrical arcs from a distance of 30 cm (see Figure 2). The energy consumption involved in these tests is equivalent to that of a three-person household’s annual energy consumption. The test is carried out successfully if there are no holes in the clothing and the fastenings still work, so it can be removed quickly by the wearer, if necessary. Figure 2: Our uvex high energy jacket (from the uvex textreme fire + arc product range) passes the electrical arc test with flying colours. In the testing box (this is where the name “box test” comes from), are two electrodes connected by an ignition wire. One electrode is made of aluminium and the other of copper in order to achieve the most realistic testing conditions. 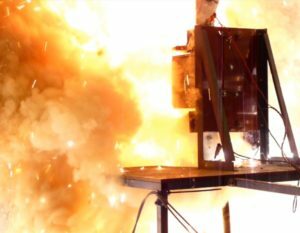 The inside of the testing box is made of non-conducting, heat-resistant plaster and curves inwards, which ensures that the released energy is immediately reflected and fully directed at the dummy. Imagine, that instead of the dummy, it is an actual person standing there working with electrical systems. There can be no doubt as to the importance of wearing personal protective equipment that covers the entire body, from head to toe. How can we get your qualified safty clothes please? As we don’t sell safety textiles in every country, that totally depends on where you’re from. Would you mind contacting marketing@uvex.de with your enquiry?